The «SVR» company was established in 2003 to adopt forward-looking, state-of-the-art technologies and methods of ventilation equipment manufacturing. We have all necessary means along with developed infrastructure which enable us to successfully operate on the market. 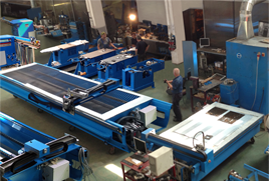 As well as automated lines, plasma arc cutting units, decoiler units, sheet bending machines, seam rolling and seam closing machines, edging machines, creasing machines, seam welding units etc. Since it's establishing "SVR" Ltd. increased number of produced machinery models to 60. Stably high quality level of the products catches attention of both the Russian and foreign customers. The whole range of products has European quality certificates and complies with all European standards. More than 2000 units of high-quality equipment are operated in many enterprises and have good reputation both in Russia and abroad (USA, Canada, Australia, Malaysia, South Africa, UAE, Israel, UK, etc.) One of our main goals is to follow individual customers' requirements and implement innovations. Our highly experienced and skilled specialists let us develop business relations with many international companies. Along with the high quality machinery we deliver full range of services, such as customer's employees trainings, start-up and commissioning works, warranty and post warranty maintenance. Some of our automated lines are designed as modular systems, allowing the Customer to decrease substantially initial investments and to extend the line as the production volume increases. We are looking forward to working and cooperating with you!